Season’s Greetings! 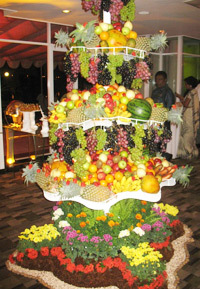 Sri Lankans love to party and happily join in the celebrations of the feasts or holy days of all religions. December 25 is a public, bank and mercantile holiday throughout Sri Lanka. Even though it is a Christian festival, the government sometimes regards Christmas Day as equivalent to a (dry) Poya (Full Moon) Day and bans the sale of alcohol then, so visitors need to make advance arrangements if planning a traditional Christmas wassail. Since Sri Lanka is within six degrees of the Equator, Christmas Day is usually sunny and hot, making an unusual experience for visitors from the West accustomed to cold and even snow. While all the mainstream Colombo and beach hotels put up decorations and lay on sumptuous buffets (yes, with turkey) on Christmas Eve and Christmas Day, guesthouses leave tourists to their own devices. For the independent tourist in search of a little chill, to chill out during the season, the colonial hill station of Nuwara Eliya (at 6,128ft above sea level) is a favourite resort. Or commemorate the occasion by joining pilgrims of all religions making the climb up Adam’s Peak (7,359 ft above sea level) on Christmas Eve night to watch the sun rise on Christmas Morning. Another way to mark the day would be to visit Adisham (4,695ft), once the seat of colonial gentry, now a Benedictine Novitiate near Haptuale, and to explore the butterfly sanctuary next to it. Most visitors rush through Kalutara, a busy town on the west coast dominated by a tall, brilliant white stupa on the banks of the broad Kalu Ganga (Black River) where local tourists stop to worship and make donations for a safe journey. Yet it’s worth stopping at Kalutara for a few hours to venture two kilometres inland where rubber trees grow and visit an astonishing palatial building with a crenelated façade. 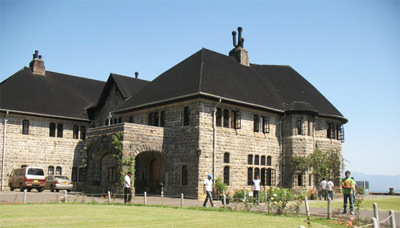 This is Richmond Castle, restored in 2011 after years of neglect since being abandoned by its creator and turned over to the Public Trustee Department to become an orphanage. It still functions as an orphanage for 45 boys of all religions from six to 16 in age, who attend schools in Kalutara and live in an adjoining outbuilding, formerly the servants’ quarters. After decades of being off limits, visitors can now take a guided tour of Richmond Castle under the watchful eye of a charming lady guide who recites details about this fascinating building. 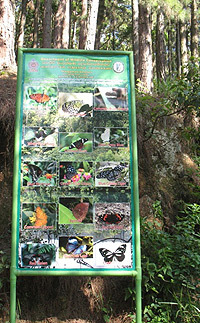 It is open 08.30-16.30 on weekdays; admission for foreigners Rs100. Richmond Castle is said to be constructed on the lines of an Indian Maharaja’s palace although it has classical gothic, not Oriental, flourishes. 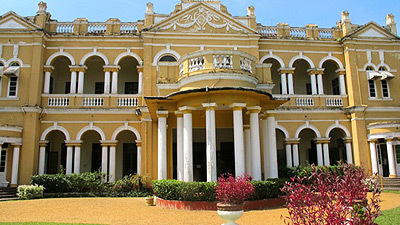 It was opened in 1910 for the wedding of the owner, Don Arthur de Silva Wijesinha Siriwardene. He was the son of a wealthy landowner, educated in England where he saw the grandeur of the residences of the wealthy. 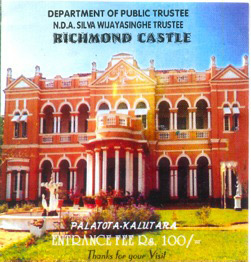 To tour this building is to gain a fascinating insight into the way of life of the Sri Lankan aristocracy in the early 20th century. Of course there was no air conditioning then but a system of strategically placed holes and tunnels channelled cool air from its riverside location into the ballroom, distinguished by its ornate carved teak pillars. 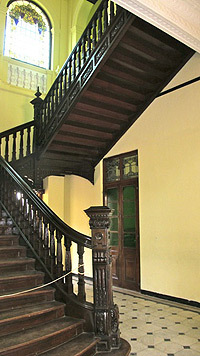 A winding wrought iron staircase reaches a minstrels’ gallery above it, while the main staircase with two wings and sturdy pillars is a solid creation of Burma teak. The windows are of imported stained glass, the floors of marble. The guide tells visitors the garden is 42 acres in area; from the balconies of the house there are views through groves of coconuts and mango trees of the river and the shining white stupa of Kalutara. The house itself spreads over one acre but has only 16 rooms, with 99 doors and 38 windows. 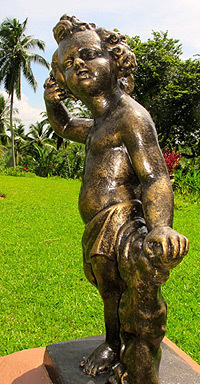 The garden is studded with statues of children, said to reflect Don Arthur de Silva’s desire to be a father. The guide regales visitors with the life story (and family connections) of the house’s owner and his wife and their eventual disillusionment with both the house and each other since they weren’t blessed with children. As a result, Don Arthur de Silva turned over his Castle to the Public Trustee and retired to a room at the Queens Hotel, Kandy, where he died as a lonely eccentric in 1947. Regular visitors to parts tropical know that one of the banes of drinking in the tropics is the ice. While reputable hotels and guesthouse (and commercial icemakers) use filtered water to make ice, the local eateries and bars do not. So it’s best to have chilled bottled drinks rather than adding ice of uncertain provenance. I have recently discovered another reason for not demanding ice in my whisky & soda. At a pub in Colombo, I happily paid the bill only to discover the next day when I examined it, that I had been charged Rs70 (33 UK pence) for the ice I had asked for. So be warned: sometimes ice is an extra! 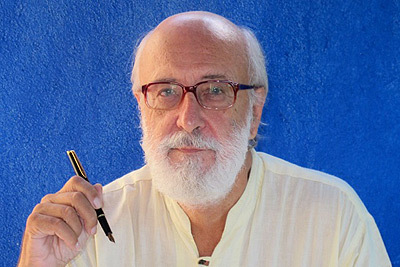 INSIDE SRI LANKA – A monthly insider’s report by Royston Ellis. January 2014.